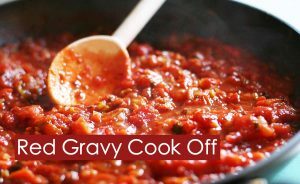 This Sunday is your opportunity to weigh-in on South Philly’s best red gravy at the 4th Annual East Passyunk Red Gravy Cook-Off. Try fifteen different types of gravy with pasta, New York Bakery bread, salad, and Triangle Tavern’s famous vegan meatballs. Sip complimentary Vin Café wine and finish off your meal with Rival Bros. espresso. The competition brings together amateur and professional chefs for a blind tasting. Over $400 in prizes will be awarded to winners of the Judges’ Choice and Crowd Favorite. This year’s panel of judges includes Geno Vento of Geno’s Steaks, Councilman Mark Squilla, and “Mamma” Maria di Marco, owner of Mamma Maria Ristorante Italiano. The event takes place on Sunday, April 22nd from 4pm-6pm in the Ss. Neumann and Goretti High School cafeteria. Enter the event through the parking lot at 11th & Moore Streets. Tickets can be purchased here. All proceeds benefit the East Passyunk Crossing Civic Association. Kids 12 and under dine free!